The Chessmen formed in Vancouver B.C. in 1963 and first released an instrumental 45 of "Meadowlands" and "Mustang" on London Records. Their follow up single featured Terry Jacks on Vocals singing "The Way You Fell" and "She Comes By Night" which reached #4 on the local charts. Members Terry Jacks on Rhythm Guitar and Guy Sobell on Lead Guitar were joined by several different bassists and drummers during the band's existance including members Bill Lockie, Al Wiertz, Miles Kingan, Larry Borisoff, Kenny Moore and Duris Maxwell. The Band travelled to Nashville in 1965 with a newly added member Bruce Peterson, who played electric 'Chordovox' accordion. In Nashville they recorded two singles for Mercury records before their break up in July 1966. This long awaited CD contains all of The Chessmen's single fully re-mastered from the original master tapes under the supervision of Terry Jacks. Also included are bonus rockin' tracks of the band playing live in 1966 and an unreleased track from their first recording session. 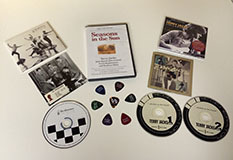 Rich historic booklet contains never before seen photos of the band shot by award winning Vancouver photographer Franz Lindner (1999-2010) and the full story of The Chessmen from day one.